Stunning! I took some photos of our olive trees in the snow last friday, very striking. I’m loving this years chill. Your photo of the ice crystals was beautiful. Wonderful details in this macro. Thanks LD, I’m glad I resisted the temptation to stay in bed. Another great image depicting the frost. Here in the States, we have black ice – it is when the road has a coating of lice on it so thin that you cannot tell you are on icy pavement until it is too late. Thanks Robert, probably one more post from that morning before I bore people! Fabulous capture Lisa. Brilliant detail. I really enjoy these shots… You just want to keep looking.. So much to see! 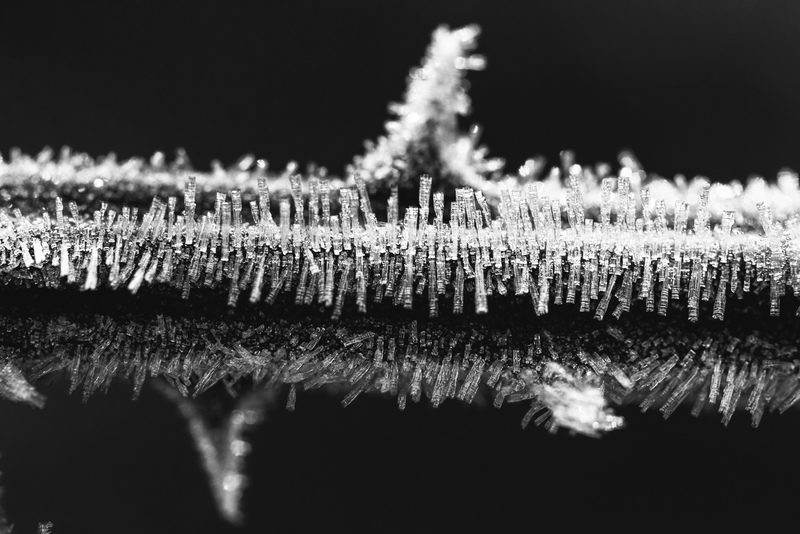 The crystals were only about half the length of yours, but hey… Its frost! Yay! Gee you’ve really had some cold weather! a beautiful submission for MM!! a beautiful and delicate as well photo! Crisp and sharp, just like Blackberry should be. Just wonderful, LIsa! Fortune favors the prepared, and it surely shone on you for your foresight in arising early. I’ve long been a fan of studies of ice crystals in their myriad forms, and this is a beaut! Hi Gary, this comment slipped through the net, apologies and thank you as always!